Posted on 4, October 2016 by EuropaWire PR Editors | This entry was posted in Energy, Gas & Oil, Infrastructure & Utilities, Spain and tagged Electrical energy, Electrical energy demand in Spanish peninsula, Red Eléctrica. Bookmark the permalink. MADRID, 04-Oct-2016 — /EuropaWire/ — The demand for electrical energy on the Spanish peninsula in the month of September is estimated at 20,832 GWh, a value 6.3% up on that registered in the same month last year. After factoring in the seasonal and working patterns, electrical energy demand on the Spanish peninsula increased 3.8% compared to September 2015. In the first nine months of the year, demand for electrical energy on the Spanish peninsula is estimated at 187,810 GWh, up 0.1% on the same period in 2015. After having factored in the seasonal and working patterns, demand for electrical energy was 0.1% lower than in the same period last year. In September the generation coming from wind power reached 2,683 GWh, a value 10.6% lower than the same period last year, and represented 13.5% of total production. 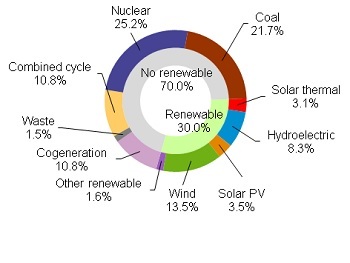 In the month of September, using data available at 3o September, generation coming from renewable energy sources represented 30% of production. 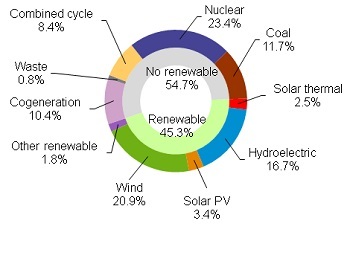 55.2% of electricity generation during the month was obtained using technologies which produce zero CO2 emissions. Also on Facebook through the account RedElectricaREE.